For years, the residents of this South Los Angeles neighborhood have wanted to create a park that would reflect their community's diverse interests and backgrounds. Funding provided by California State Parks, Department of Parks and Recreation, Statewide Park Development and Community Revitalization Program, awarded in April 2012, to build a quarter-acre South Victoria Avenue Park will do just that. In store for kids is a dynamic new playground, replete with a skate area and junior-sized basketball court. Adults will get their day in the park, too! Fitness Zone® installations will be installed in the park, offering neighbors the opportunity to exercise and get fit together. 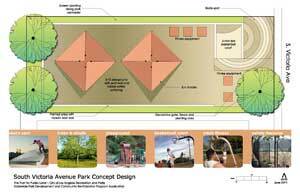 Features like night-sky friendly lighting, a decorative fence and gate, and drought-tolerant plants will address the community's concerns about park security and maintenance. Acquisition for the property on South Victoria is pending.